Wendy's World | Social commentary and opinion on news, events and parenting. I knew it was bound to happen. But when it did I wasn’t prepared. I saw my Dad today. Yes, it’s been nearly six months since he died, but there he was standing on the pavement at Gordon. I’d just emerged from another specialist, mulling over the crappy year I’ve had, when I saw him about 25m ahead. It took my breath away, made my heart pound right up into my ears. My eyes brimmed. I froze. It was him. It was Dad. My brain knew it wasn’t him, logic defied it. But for just one split second the last six months were erased and everything was back to how it should be. There he was in his blue jumper, his beige pants, same height, same build, same stance, standing there, waiting to pick me up and share my news as he normally would. Except it wasn’t him. It was someone else. As I approached, a woman joined him, and as I passed he looked at me with the same piercing blue eyes of my Dad. It hurt all over again. This time last week I was having a chat to my dad on the phone. It was our third call for the morning, even though it was only 10.35. Sometimes that happened. I’d hang up and remember something I’d forgotten to tell him, or he’d ring back to tell me something I mustn’t forget to do. Such was the nature of our relationship. This time last week, as we made arrangements to meet at the Belrose Supa Centa, the call was different. I knew better not to argue. A heatwave was forecast for the day, and dad, sensibly, had decided not to play his usual Saturday golf. Rather than lounging around on a hot day like a normal person, he was programming a day with his daughter to eliminate her junk. And apparently, according to this neat freak, I had a lot. You see dad had recently inherited Micky’s old iPhone and his theory when ‘the bloody thing’ wouldn’t work was to stab random buttons. I figured he’d randomly stabbed and disconnected our call. I rang him back. In fact, I rang back three times and texted once, before I stopped, thinking he was probably trying to ring me, as I was ringing him. That’s happened before. But this time Dad wasn’t ringing me back. He was lying immobilised on the floor, struck violently by a massive stroke. I imagine him trying to reach his phone, to answer my calls. But I don’t like to think too much about that. After no response I called Dad’s neighbour, Betty, asking her to check on dad, and from that moment on my world changed. Looking back over this whole scenario, this time last week, I marvel at the astonishing series of events which led to getting my stricken dad to hospital so quickly, within an hour. More often than not stroke victims aren’t found until hours, or even days, after the attack. The fact I was on the phone to dad when he collapsed. The fact I rang his neighbour Betty. The fact Betty was home. The fact the neighbour Tim, trained in first aid, was home upstairs. The fact Tim yelled out to his wife to immediately call an ambulance. The fact the ambos arrived within about 20 minutes. No amount of planning could have got dad to hospital more quickly, which is why I get angry to think I am sitting by his bed six days later watching him die, regardless. Despite the fact all the doctors at Royal North Shore thought it amazing to see a stroke victim admitted to hospital so quickly, despite the fact he was given a clot buster to dissipate the blood clot which whacked him in the brain, all positives for recovery, this bloody monster stroke hit my dad like a Mac truck, right out of the blue, destroying a large area of his brain instantly. In that split second after I asked what time he wanted to meet at Bunnings, my dad, Micky’s 87-year-old beloved grandpa, disappeared. He was replaced by a Leonard. That’s what the specialists and the doctors call him. No one I knew called him that. No one who loved him called him that. Len was gone, replaced by a very ill mumbling and incoherent man called Leonard. The stroke had hit on the right side of his brain, completely paralysing the left side of his body. When I was finally allowed to seem him that Saturday afternoon, he was talking in garbled sentences. He was worried about his phone, where it was, because he was holding it when he collapsed to the floor. He was adamant he was in Hornsby Hospital, not Royal North Shore, that he hadn’t had a stroke, and was only on the floor because he was looking for his phone. He wanted to go home to his ‘own little bed’, telling Micky and I to just ‘drop’ him off. But he wasn’t going home. After that savage split second, dad would never walk into his unit again, he wasn’t going back to his own little bed. My brain grasped this quickly, my heart tore in two when I instructed the doctors there was to be no intervention. Micky, however, refused to give up, begging that everything be done to save her Grandpa. He called her Micky Doodah when she walked into ICU, which meant he was fine, didn’t it? He knew her, he would be all right. And this was her grandpa, her most fierce protector. Her best mate. He was always there for her and she was going to fight to save him. Dad survived the first crucial 24 hours, and as the hours dragged on he became more and more coherent. On Sunday, while still adamant he was at Hornsby Hospital, he accepted he’d ‘apparently’ had a stroke. Drawing from the most used part of his brain, which was to care for his girls, he kept looking after us. He told me to water the new hedge he’d help plant the year before, to make sure we got Micky’s passport sorted, to find all the golf club numbers in his Pymble Golf Club diary. When Micky left him on Sunday afternoon, he warned her to ‘watch those speed zones’. He told the young male nurse he shouldn’t have to ‘look after an old geezer like him’ and flirted with the young female nurse, only to tell her that the most beautiful nurse in the world had been Meggie, his wife. The nurse, intrigued by this very funny, stubborn, kind man, indulged him with some mathematical calculations after he told her he could add up faster in his head. He passed them all. Oblivious to the fact he couldn’t move his left leg, nor his left arm, he made several determined efforts to bolt, pulling out his cannula and sticking his good leg defiantly on the ground. He didn’t understand he’d never go home, nor drive his car, nor walk the dog again. He didn’t comprehend he’d never pop into my house again to fix something, plant something, or give the cat a cuddle. Crueller still, he had no clue, he’d never play golf again, just days after his last game when he’d proudly won the day. By Monday, he had accepted he was at North Shore, and was making more sense. I started dangerously veering off course, as optimism began to emerge in the emotional part of my brain. The doctors, while insisting I’d never be able to care for him at home, talked about rehab. Perhaps, I thought, he would be okay in a nursing home, even if it meant being confined to a chair. If we could communicate ….. Right on cue, as hope began to cloud my brain, Dad had a seizure. Clearly, he didn’t agree, and as he fitted and struggled, the emotional part of my brain died as quickly as it had materialised. I was dragged back into Len mode. If he wasn’t having any of it, then neither was I. As the medics prepared to wheel him down to have a scan, I asked them to wait. I told my father it was okay to go. I told him Micky and I, his girls, would be fine. I told him that Meggie was waiting for him, that my brother Nigel was also there with his big broad grin. I told him his work was done. I told him this was the one thing he couldn’t fix. I told him it was okay to let go. I basically told my dad, my best mate, to die. He hasn’t regained consciousness since that Monday afternoon and I sit here by his bed, just a week after our last hilarious and cheery conversations, waiting. I have moved into his room and I won’t leave until he goes. I can’t be anywhere else. I hold his hand and chat to him. He grasps it strong and hard when my love ocasionally connects through to the faulty wiring of his brain. He knows I’m here. I have no doubt. Ironically, it’s the huge, huge heart of this kind, loving and generous man, beating so strongly, which won’t free him. So fitting, but I wish it would just stop and rest. This time last week I was planning to spend the day with my dad, having a blue or two over our vastly different definitions of junk, admiring the agapanthus he’d planted the day before, chatting about the heat and how he was missing his game of golf. This time last week my dad was my rock, my best mate, my protector. It’s time for me to be his. Tomorrow is the first day of the teen’s last year of school. Yep, she’s bouncing into Year 12, and when I say bouncing, I mean she’s ricocheting off the walls, at times reaching stratospheric heights as she thinks of all the wonderful things awaiting her at the top of the totem pole. In between the teen sleeping in, signing out of school, trotting off to lunch, going to the beach and heating her soup ‘IN THE MICROWAVE!’ I idly wondered whether she planned on any schoolwork. Perhaps there just wasn’t time for that. Not once have I seen a flash of fear cross her face as she contemplates Year 12, her HSC year. And that’s exactly how I like it. I’ve listened to, reported on and written about dozens of teenagers crippled with excruciating angst over the HSC, for decades. Depression, anxiety, illness, and on more than one occasion suicide, have destroyed families, all because their children become too terrified of what they perceive to be the biggest test of their lives. They can’t comprehend that failing this test, does not fail them in life. Sometimes, it’s their parents who fail them – parents driven by ridiculous and irrational zealotry who push their children to impossible and unhealthy limits. I have heard parents tut over ‘worthless’ TAFE courses offering subjects I see as valuable life skills. I have watched parents choose their child’s subjects, because they’re good at them, not because they are passionate. I witnessed with horror a parent challenging her child to get into medicine, despite her son desperately wanting to be a primary school teacher, and another pushing for law, when all her daughter wanted to do was study music and sing. Her daughter is now dead. 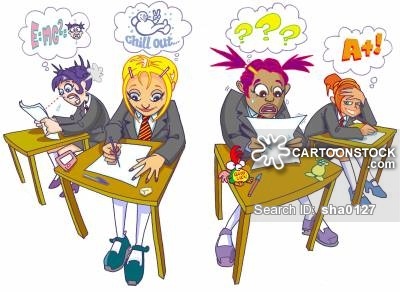 It’s such a damn shame when during one of their most crucial and formative years, many teenagers are stressing themselves stupid, rather than looking forward with joy to their last hurrah with their schoolmates. What should be a golden year of discovery, and dare I say, fun. Instead, they fret over subjects, tutors, overcrowded timetables and time-consuming study plans. They deprive themselves of subjects which inspire because they won’t count towards an ATAR, and spend hours tormenting over their future while robbing themselves of precious moments in the now. Reassurances that the HSC really only proves how good they are at sitting an exam fall on deaf ears. Trying to convince them that this one-dimensional series of tests will not define their futures is inconceivable. They can’t see that even just two years down the track the HSC will register as just a tiny blip on their radar of life. I’m not saying the HSC is not important and I will encourage the teen to work hard and do the best she can. But I shan’t allow it to consume her. To be honest, I’m more interested on her learning to apply the discipline to do something she’d rather not, than the marks at the end. That’s a skill she’ll take through life. Cementing friendships, overcoming social challenges, dealing with loyalty and disloyalty, heartbreak and hope are others I want her to hone over the next 12 months. They are what build self esteem, confidence and clout, they are what will determine her in the future. Just 24 hours ago I was standing at my front door waiting to welcome 60 teenagers into my home to celebrate the teen’s 16th birthday. Over the past few weeks I can’t tell you how many parents told me I was brave, how many tut tutted and shook their heads in disbelief, warned me of trouble, or simply said ‘good luck’ when I told them we were having hoards of teenagers in our house. But I was determined. I remember my 16th birthday bash fondly, and I wanted my daughter to share that experience with her own friends. I was prepared to take my chances. Now, weary to the core, having just finished the last of the cleaning up, I ask myself, would I do it again? Would I have so many teenagers back in my house? And I have to say, yes. Yes, I would. In a heartbeat. Yes, it was loud, very loud, the cheering and stamping of feet sometimes drowning out the boom of the doof, doof. Yes, there were drinks spilt, popped balloons glued to sticky floors adding more psychedelic contrast to the jellybeans leaking colour onto the white tiles. Yes there was a fair bit of lip locking, some hysteria and drama, (mostly from the girls), and yes, a drop of grog was smuggled in. Yes, there were gate crashers… kind of. Two of them arrived, one by bicycle, the other on a skateboard, primary school friends of the teen, and so pathetic in their execution of trying to crash, I let them in out of pity. And yes, I woke up to ten exhausted teens sleeping around the house, the boys in the living room slumbering peacefully until the girls upstairs stirred and came downstairs to yap at them… incessantly. I fed them and listened to their post mortem of the night. The feedback was good. The party was clearly a hit. As it was for me. I am so proud of the teen and all her friends who danced, shrieked and whooped till they dropped. You were fantastic! To the parents wary of hosting a teenage party, don’t be frightened of what could go wrong, just be confident you’ll handle it if it does. Make sure you know your teen’s friends, that’s important. Very important. It helps if they know you too, as they become deliciously protective of The Mother. Our home last night was filled with boisterous, rowdy joy and celebration, 60 young lives about to take off and explore their worlds as adults. They were priceless memories. Meanwhile, the floors have been mopped, the furniture put back, the yard cleaned, the cake cut and stored, the lollies retrieved from the cracks in the deck. Even the lost property is sorted, except for the sock which stored some hidden grog. I’m not quite sure what to do with the sock. Just as I’m not sure about how to help the constipated Cavoodle snoring on the sofa, stuffed full of party pies, cake, chicken tenders and marshmallows. It will take a little longer for him to recover. 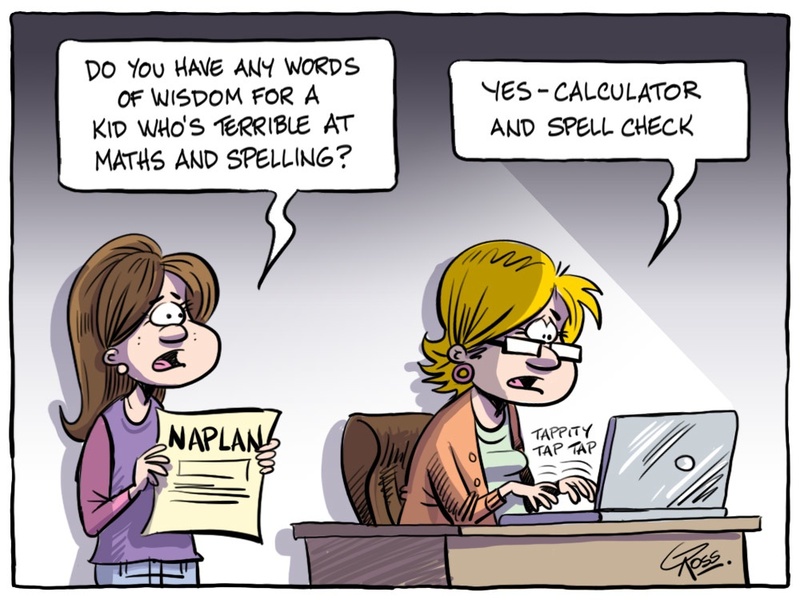 The teen had NAPLAN this week. She’s in Year 9 and spent three days of her life stuffed into a classroom answering questions that have little relevance to her daily life, or her future in fact. You see the teen is not a great academic. She tries hard, but maths and spelling don’t come easy. We’ve had her tested, poked and prodded, we’ve made her roll around on balls, answer long questions about her feelings and eat a handful of almonds every day. (I kid you not, it cost me $350 to be told by a nutritionist that a handful of almonds every day would help feed her brain). I had her examined to the extent she felt like a lab rat in our efforts to discover the root cause of her learning difficulties. And all it did was make her feel a failure. All it did was make her feel stupid, that no matter how much money we spent, nor how many hours after school she had extra coaching, none of it helped. So after thousands of dollars, and many, many wasted hours, I said enough is enough, and held a family meeting. I announced to the teen and Grandpa the blatantly obvious. I told them the teen sucked at maths. Then I surprised them. It probably took Grandpa a little longer to recover from this, after all, he was of the generation where maths had to be taught because calculators weren’t available. The only way you could work things out was in your head and through problem solving. Maths to him was an everyday lifeline and he can still add up in his head faster than anyone armed with a calculator. But that’s not how it is today, and in the very unlikely event that the teen wanted to become a scientist, or study theoretical physics, maths wasn’t a deal breaker. As for spelling? I know several good journalists who can’t spell to save themselves. But they are accurate, they know how to gain a person’s trust and they tell a damn good story. The happiest day of their lives was when we transferred from typewriters to computers and embraced the world of spell check. I just didn’t see the point of watching my daughter continue to be stressed and made to feel inadequate all because she wasn’t good at the mainstream subjects schools place so much importance on. I told her that NAPLAN and indeed the HSC only proved how good you were at sitting a test, they didn’t define your future. As I explained myself to the pair of them I could almost physically see the weight being lifted of the teen’s shoulders. In fact, I’m sure her shoulders have got squarer and she’s been walking taller ever since. Once she understood that her life would not be measured by her ability to solve equations, she felt accepted. She felt normal and more sure of herself with her friends. She learned to laugh at her goofy mistakes and felt encouraged that her future was as bright as anybody’s. While her grades were low, her grades for effort were always high. And that’s all that mattered to me. So, this week, during NAPLAN, she bounced off to school with a healthy attitude and a spring in her step. She probably won’t crack the tests, but she’s a cracker of a kid. Maths, or no maths. Restaurants are finally taking charge and taking badly behaved kids off their menus. And it’s about time. Some venues are going a step further and banning children altogether. More power to them. You see, not everyone agrees children should be allowed everywhere adults are, nor does everyone agree that children have more rights than adults. For example, if I chose to run around a restaurant squealing, or threw myself on the floor wailing, or indeed kept bumping the chairs of other diners, I’m pretty sure I’d be asked to leave. I’m also guessing the police would be called if I refused. Why then is it acceptable for children to behave like that? I’m certainly not a wowser and I believe children should be taken out to dinner, but only if they behave. If they don’t, call the babysitter. My teen has frequented restaurants since she was three days old when we stopped for a bite on the way home from the hospital. Throughout her toddler years she ate out often, but only in child-friendly venues, never adult bars, nor fine dining establishments – they’re for grown ups. She was always on a tight leash, and the outing was less for her entertainment and more for her to learn how to behave. The old “seen but not heard” approach worked for me. However, in a society where parents are stupefied to the eyeballs from happy clappy parenting books, brats are ruling far too often. We’re constantly told to “LUUURVE” our children. Not rocket science, but we are supposed to “LUUURVE” our children to the point where saying NO! is seen as a negative no, no. Don’t smack! Don’t shout! Talk to them and negotiate (yeah right, like that works in the middle of a restaurant when Miss Two is flat on her back throwing a wobbly). Don’t isolate, don’t exclude (particularly when they’re behaving badly because that’s when they need your understanding the most), stimulate them constantly with games, computers and videos (heaven forbid they might become bored and be forced to amuse themselves), and don’t let them lose, (that might make them feel bad or sad, and we definitely can’t have that!). Overload them instead with constant praise and a false sense of importance so they believe they can do anything and everything (even when they can’t). It’s no wonder children erupt when another adult says NO! to them. When all of a sudden they’re expected to behave in restaurants as in the “sit at the table, no screaming, running, nor horseplay” kind of behaviour, the rules in force for children at Borruso’s Pizza and Pasta in Sydney. I have to admit though I’m as confused as the children, not by the rules implemented by the pizza restaurant, but by the reaction from parents who don’t think they should apply. One indignant parent found the tone to be “intimidating” and “unsuitable” asking children “not to behave like children”. you do, and although this may come as a dreadful shock, some people may even think your children are a pain in the neck. And you know what? Sometimes they are… my child included. And when they are being a pain, and they are in public, it’s not the job of other adults to smile benignly and tolerate their bad behaviour, it’s your job to rein them in. And if you can’t be bothered, take them to a joint like MacDonalds where other people’s kids can drive you nuts as well. When I go to a restaurant I don’t want a side order of brats, nor a serving of indignation from precious parents. I want to enjoy a meal and conversation around the table, both with my friends and our children. Time out with the kids does not mean time out for the parents. 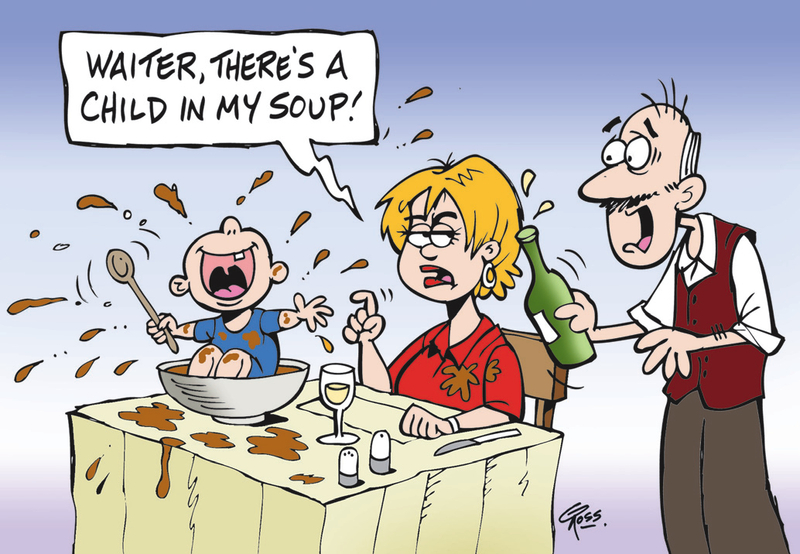 Are you sick of children behaving badly in restaurants? Or perhaps you find it outrageous that some restaurants are banning children? Let’s discuss.